At the Capitol Thursday, calls for action on gun violence. 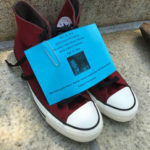 Riley Reed, a student intern with Wisconsin Anti-Violence Effort, one of several people who spoke in front of hundreds of pairs of shoes arranged up the Capitol steps. “I see these shows and it compels me to do something,” she said. Each pair of shoes represented a victim of gun violence, a “silent march” on the Capitol. A pro-gun rights group is planning an event at the Capitol on Saturday.